Miscanthus (mis-kanth-us); Poaceae Family. 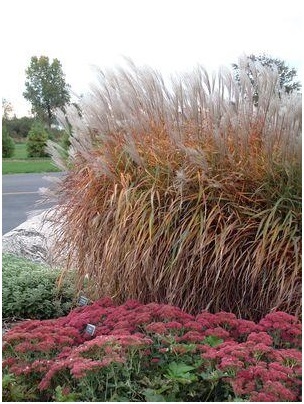 Miscanthus are tall perennial grasses grown for the eye appealing ornamental effect in landscape or border, as well as for their decorative qualities in dry bouquets. Broad, grass-like leaves and silky, feathery flower clusters. Arching foliage and feathery summer plumes make it a great late-season privacy screen as some varieties can reach 8 feet tall or more. Miscanthus sineneis (sin-nen-siss) eulalia. Mostly from China and Japan, this is a common grass that forms leafy clumps 4 to 10 feet tall. The leaves, 2 to 3 feet long and 1 inch wide, have whitish mid ribs. The drooping flower clusters are up to 2 feet long. The variety gracillimus (gras-sil-im-us) has narrower leaves. Easy to grow and is a good choice for beginners, Miscanthus will grow in most any soil, from loose sand to heavy clay, and does not require good drainage. Grow this in full sun except in warmer regions where some afternoon shade is best. Fertilization is not necessary. Miscanthus is versatile from a design standpoint; it can be used as a specimen, for massing or screening, in large containers, or at the pond's edge. Plant this where it is a wonderful winter interest can be enjoyed. Foliage should be left standing throughout the winter for visual interest and to provide protection for the crowns. Substantial clumps tend to flop (or totally collapse when subjected to heavy winter snows), and will often benefit from some support. Cut foliage to the ground in late winter just before new shoots appear. Attributes: Border plants, Containers, Cut or dried flower, Mass planting, Rock gardens, Specimen or focal point plant, Deer resistant.